About a month ago, I replaced my Apple TV with a Chromecast in my home gym. With the Apple TV I would listen to podcasts, Pandora, or catch up on TV with Hulu Plus or HBO Go. I would occasionally watch Ted talks or YouTube on the Apple TV. 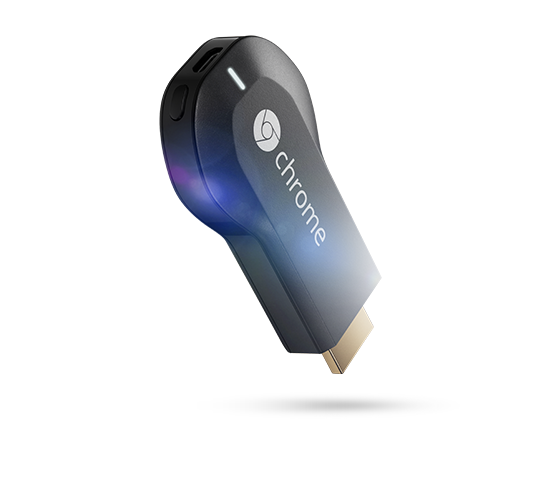 By comparison Chromecast seems pretty limiting. At first they had only YouTube and Netflix. There is now Hulu Plus and Google Play Music. Just today I signed up for All Play to give that a try. Of course Chromecast relies on having some other device to stream the content, it works with Android and iOS devices as well as the Chrome browser. It's cheap, at $35 I really shouldn't complain, but of course I will. The Apple TV is $99 so you're giving up a lot to save $64. It's small, pretty much the size of a large USB stick. It still needs a power connection so you'll need to find an outlet or a USB slot somewhere to get it fired up. I plug mine into the back of my Apple Airport which happens to be near the TV. Heresy I know! It's easy to setup. I got it going pretty quickly. I can't even remember the process now, so it was pretty seamless. Side Loaded Music doesn't work with Chromecast. You need to buy music from Google or sign up for All Play at $9.95 per month. After six months you've spent enough to by an Apple TV and use Pandora or you own music library for free. Needs a buddy device at all times. It's useless unless you have an iOS, Android, or comptuer with you. Most apps aren't yet compatible with it. I'm sure this will change over time. No podcasts as far as I can tell. Maybe there is a way to play them but I haven't figured it out. So overall it's not worth it as a replacement for the Apple TV. However, I think it would be a good solution for watching TV when you travel. I like the idea of popping it into the hotel TV next time I travel. I'll drop it in my suitcase next time I travel. Time to hook the Apple TV back up and catch up on the Fresh Air podcasts I've been missing.